Entering your dog into a pet calendar contest is a fun way to support your local rescue. With money raised from contest entries and votes going directly to the designated non-profit organization (and big grand prizes often up for grabs for entrants), submitting an awww-inducing photo is an important first step toward earning more money for the recipient rescue–and ultimately more votes for your pooch. Here are five easy tips that will help you maximize your chances at winning a pet calendar contest. Never underestimate the power of a sharp, focused, and properly exposed photo. Eliminate clutter and distracting backgrounds and puh-lease go easy on the filters or scrap ’em all together. (Let’s be real: Instagram’s Kelvin and Amaro filters aren’t flattering on anyone!) Simple well-lit shots that put your four-legged friend front and center tend to rack up the most votes. 2. Play up your pet’s pawsonality! Do you have a bed-hogging bulldog? How about a snow-loving northern breed or a charismatic corgi? Rather than trying to set up the perfect portrait, use these distinct quirks and qualities to play up your pup’s pawsonality. Consider incorporating your pet’s can’t-live-without toy or an adorable accessory, snapping some shots of her snoozing in her snuggliest spot, or capturing him in the middle of a game of tug or fetch. If a particular moment brings a smile to your face, ends in a gut-busting laugh, or just pulls on your heartstrings, it’s likely to evoke the same emotion in others as well. Pet photos are much more engaging when taken at your dog’s level. Don’t be shy about crouching or contorting yourself into your own version of downward dog in order to get a more unique perspective–that of your furry friend! Your images will appear more inviting and natural (despite how you may have felt at the time you took it). 4. Look for the light. Eliminate harsh flash for a soft, natural look. A slightly overcast sky or even light from a window or sliding glass door works wonderfully to add sparkle and life to the eyes in the form of catchlights, or the subtle white reflections visible in the corners of a subject’s eyes. Simply position your pet with his face toward the light to create effortless catchlights. 5. Remember, the eyes have it. One look into those pleading puppy peepers and you’ll totally understand that old adage that the eyes are the window to the soul. Animals have some of the most expressive eyes, which is why it’s important to have them in focus. 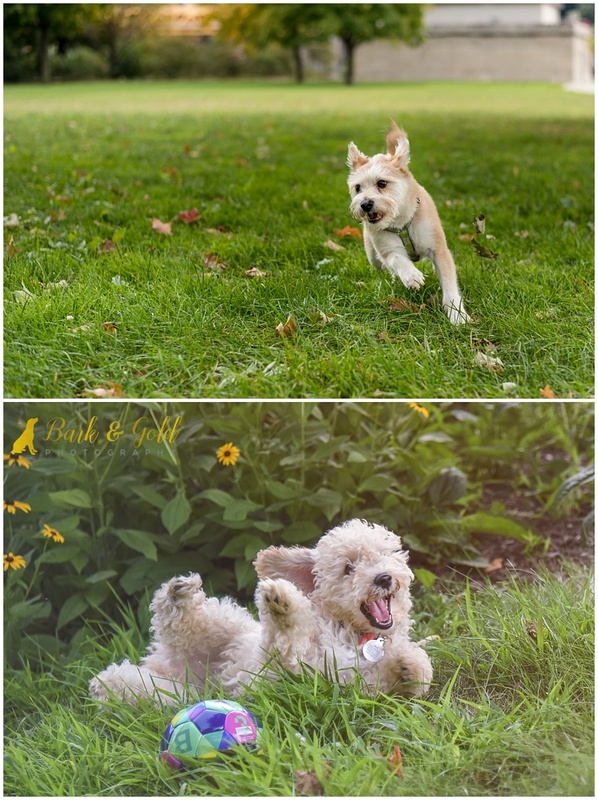 If you would like to book a Bark & Gold Photography session for your pet, click here or give me a call at 724-913-BARK (2275). For more information on Bark & Gold Photography sessions, visit “Your Session” in the menu and be sure to share your email on my homepage to join the VIP list.